My first thought about the themevideo is one word: fancy. I can tell that the producer really spent a lot of money to do the special effects on this one. Was it 40 million hong kong dollar? I don't remember, anyway, it is expensive. The theme song sang by Raymond, and I didn't like that song at the beginning, but after a while, I got into it.... Especially the end of it, the tian-an-an-annn-annnnnnnnnn part, I just loved it! In my screen captures, you can see the first appearances of the major characters, the image has their names on it. Raymond and Ron's first appearances are pretty funny, they are the trouble maker in a village, who move place to place to look for a kung fu master. I like Tavia's first appearances, she looks very pretty in this series, and Raymond already went crazy for her. As for Li Qian (appeared in episode 2), she is the mainland actress, I don't think she is pretty, but I really like her character, she is very cute, and perfect for Raymond later on. Those two start off as "enemies", watching them arguing is really fun. In episode 4, Nancy appears as a pity girl, who keeps bothering Raymond and Ron. Nancy looks good as well, her outfit is a little special. Finally, let's talk about Leila's first appearance, she is really pretty. In this series, her character is very different from the other characters she played before, and I can tell the differences. The series has a good start. I especially like Raymond and Ron, they are so funny ~.~ Those two really cracks me out. The first episode, there is a naked scene of Ron and Raymond, hehe, don't say that I didn't warn you about it. Anyway, the series is pretty fun to watch, it is also addicting.. Here comes my favorite episode so far, there are many interesting things happened in this episode, which made me begin to love the series. First of all, Raymond told Tavia about his feelings towards her, as the audiences, we all can tell that one day, Raymond is willing to do anything to match Tavia. Anything includes bad things.... Second of all, the fighting scenes of Nancy and Leila, those two fought because of Ron. Nancy asked Leila if she is also in love with Ron. Then, the most interesting of all, the new character Li Mi, he is going to be the future "father" of both Raymond and Ron. The part where Li Mi was torturing Raymond and Ron was really really funny. You began to see Li Qian's differences, she began to help Raymond a lot. As the audiences, you might figure out that she is slowly falling love with him... Raymond is still crazy about Tavia, but we don't know what Tavia truly feels. This is another favorite episode of mine. First, let's talk about the two kisses between Ron and Nancy. The first kiss, Nancy wanted to reduce Ron's pain, the second one was a little "accident". I began to wish this couple can be together, because Nancy is not that evil after all. Second of all, Nancy hurt Raymond and Li Qian, so that she can spend a night alone with Ron. However, she knew Ron only loves Leila... Later, there was a fighting scene between Leila and Nancy, and Leila was hurt, Ron protected her, this made Nancy mad. Nancy hurt Ron very badly, but she was even more hurt inside her heart... Then, we get to know Ron's last wish on earth was to see Leila's' true face... Leila also promised Ron that if he gets better, they will travel through the world together. Finally, in this episode, Raymond took Ron to see an interesting doctor. Who does Raymond love the most? Not Tavia, not Li Qian either, it is Ron! No wonder they are twin of brothers... Ron and Leila began their "friendship", not love relationship, because Leila can not falling in love. Li Qian finally knows Raymond only loves Tavia, poor girl, she is already deeply in loved... Leila and Ron had a little adventure together, from here, you can tell that Leila also likes Ron. In this episode, you get to see the best war scene so far, and get to know how smart Ron is ~.~ Later, Raymond and Ron set up their own group, named "Twin Dragon". I realized this series become more and more interesting. In episode 19, both Raymond and Ron are looking for the "Evil Ball", the entire episode is really interesting, which talks about how they find the main entrance of the grave. Also, Nancy came to help them, there is one scene when Raymond offends Nancy, and Nancy asked Ron to bit Raymond's face ten times. That scene was pretty fun to watch. Meanwhile, Leila also came, she came to stop Ron, and warned him not to look for the evil ball. Raymond and Ron finally found the evil ball, and awaken the "Evil Emperor". Raymond and Ron caught the evil energy from the evil ball, is that means they will be evil? We don't know that yet... Meanwhile, Li Qian showed us how much she is in loved with Raymond, but she won't admit it. Leila also deeply in love with Ron, she is no longer strict about her religion, she only wants to help Ron. So far, I really dislike one character, that is Tavia, I really don't know how she falls in love with Raymond, but from her jealousy, I know she is in loved, but she is selfish. I also dislike Raymond's hair style, he needs a better hair styler. Ron's hair style is much better. We all know Raymond and Ron are two different person, of course they have two different personalities. Raymond is more ambitious, Ron is more reserved. You can tell the two apart very easily. From this episode and on, they began to do their own things. Both of them have the evil spirit inside them. Ron knows how to control it, but we need to worry about Raymond... The Love Stone is really special, Raymond finally knows that Li Qian is in love with him. We can tell Raymond also cares about Li Qian, but he still loves Tavia the most. As for tavia, her contradictory is very easy to see, she doesn't want to disappoint her fiance, she doesn't want Li Qian to hurt, but she also wants to be with Raymond... Meanwhile, Ron and Leila go together to find Evil Emperor's past and his love story. There are many misunderstandings in this episode. First, people misunderstand that Nancy is Evil Emperor's daughter. Then, Tavia thought Raymond and Li Qian are in love. Last, Raymond misunderstand that Tavia used him, and treat him as a tool. In this episode, there are three lines I loved the most. The first line is from Ron, he said to Leila, "if you can help the Evil Emperor to become good, your master won't about my evil spirit, which might affect you." Leila smiled after she heard that, you can clear tell that the two are very much in loved. The second line is from Raymond. Raymond said to Tavia that she only knows how to use him, not truly loves him. The third line, which I liked the most, is also from Raymond, he said to Tavia that she is unbelievable selfish, even Li Qian is thousand times better than her! Finally, Raymond admits that Li Qian loves him. I really wish Raymond and Li Qian can be together, they have the much better chemistry. Tavia finally got married, of course Raymond is getting mad. Raymond occupied a city, and gave it to Tavia as a wedding present. Meanwhile, Ron was able to control the evil spirit inside him, thanks to Leila. However, Raymond's evil spirit is out of control, as you can see in the war scene, Raymond finally got crazy, and killing many many people... Tavia changed her hair style after she got married, I like her new hair style much better... Ron and Raymond both realized how crazy they can turn into, so they use some methods to calm themselves. Later, we found out the fact that Leila is the Evil Emperor's real daughter. She also has the evil spirit inside her. Leila went to the snow mountain, tries to freeze herself. Nancy helped Ron to find her... Raymond and Li Qian had a little progress, at least we know that Raymond cares a lot about Li Qian... As for Nancy, she sacrificed a lot to help Ron, and Ron finally realized that. In episode 28, Ron and Nancy will have a little affair... But, we all know Ron doesn't love her, he only loves Leila... poor Nancy... Meanwhile, Li Qian misunderstood Raymond, so the two break apart. Leila: "Why are you sitting here by yourself?" Ron: "You told me last time that I need to calm myself. So, I sit here for 2 days, I realized I am very calmed, and I thought the whole thing very clear." Leila: "What is your result?" Ron: "My thinking was... I never changed. Even thought I had an affair with Nancy, but I am still very clear, I love you the most!" Leila: "Ron, I am so blessed because I met you in this world!" Ron: "Leila, will you still be mad at me?" Leila: "After a man experienced the love passion, but his heart is still with me, and willing to spend his life with me. I except can love him, why should I blame him?" Ron holds Leila tight, "I will never leave you!" Leila: "I believe you heart never left me!" Because of this episode, you can not stop loving our Ron, he knows how dangerous the jade is, but he still keeps looking for it. The reason, why? He wants to stop the evil emperor, he wants to take away Raymond's evil spirit... He said, "even if I will die because of looking for the jade, I will not regret it!" He is such a man! Later, Ron tries to destroy Raymond's evil spirit, however that mission failed. Meanwhile, Li Qian misunderstands that Raymond and Tavia still has feelings toward each other... Ok, let's talk about one of my favorite scene, this is in episode 36, when Raymond and emperor Li are fighting, Ron came to stop them, he uses his hand to stop Raymond's sword, he is bleeding, his eyes were shinning, you have to admit that Ron's eyes do have spirit, lots of spirit... Also, from the way Raymond looks at Li Qian, you can tell his remorse. Does Raymond still has a little feeling for Tavia? Somethimes you will feel bad for the evil ones because you feel pity for them. For Ewong Yung, after she waited 20 years for her man, she didn't truly get his heart. Her hair turned to white in only one night, love can truly destroy everything... As for Lee Chi Hung, his love for Christine is so strong that he is willing to die... His death finally proved that Christine does love him, but it was revenge, which takes them apart... As for Raymond's love triangle, clearly, we know Raymond loves Li Qian more, but she wants Raymond and Tavia can be happily together... Why can't the both of them be with Raymond? The series reaches the sad part as the death of Li Mi will make most of you cry... other than this tragic scene, the politics will also make you mad. Our poor future emperor Li, was sent away by his brothers, his father. After all the things he did for the new dynasty, he gets nothing... But, soon, that will be changed, as you know in the history ~.~ Meanwhile, Ron and Raymond saw their future, which indicates death, that also forecast the way the series ends... Later, Raymond and Ron work together to help our emperor Li. Raymond saved Tavia's life, she said, "stay with me, we can finally be together now." Hmm.. have you ever wondered how did Tavia forgot her death husband so quickly? After many episodes of the story, the series is coming to an end. I have to tell you, this ending is the most perfect ending you will expect. Everything makes sense, and you know the ending should be this way, true, it is sad, but it is perfect ~.~ Now, I like to share the details with you, for those of you do not wish to know how the series ends, please LEAVE NOW!!!! Who is/are your favorite character(s) in Twin of Brothers? 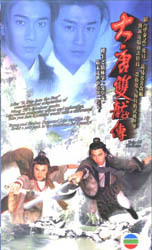 Copyright 2004 TVB.COM & TVBSquare.com. All Rights Reserved.